I dread reading classics. Four years of hard training for high school AP exams will do that to anyone. But if you feel the same, please get over it and start reading Charles Dickens’ A Christmas Carol. You can read it in an afternoon (I downloaded a copy that’s 112 pages! ), you already know the story so it’s easy to follow, and because of that, you’ll thoroughly enjoy the language that describes the very familiar story. I think you’ll find nuance and emotion you never thought would be in the original story. 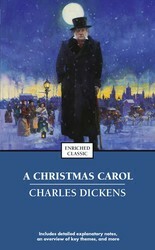 Despite my own familiarity with the story, I was stunned by how thoughtless Scrooge is. He has no regard for anyone or anything, just a very narrow focus on work, pinching pennies, and keeping his particular routine. As he heads home one Christmas Eve, he starts seeing things, and the dread with which Dickens infuses even a mundane evening walk makes Scrooge’s walk incredibly chilling. The lead up to the entrance of Marley’s chain-rattling ghost is unnerving. Not even a gentle reader such as I can be immune to a haunting after hearing Scrooge’s doubt in his conversation with Marley. I had a greater appreciation for Scrooge after seeing how painful Christmas had been as a child, and how he found joy in it as a young man, despite past hardships. And when he sees the modern celebrations with the Ghost of Christmas Present, and remembers how he is perceived as an influential person, yet is also despised and mocked for his character, or lack thereof. And by the time the terrifying Christmas Yet to Come arrives (go watch the made-for-TV version with George C. Scott from the 1980s, it scares the crap out of me to this day! ), Scrooge has changed, but I think Dickens probably wanted to scare his readers a little more. Trust me: it works. Scrooge sees his own end of days as a man worth nothing more than fodder for thieves, and he is scared out of his mind. And by the conclusion (spoiler alert: Scrooge lives! He is a changed man! Don’t tell your friends! ), it’s just pure joy to read Scrooge’s own joy in Christmas festivities, or finding happiness and camaraderie in generosity. I read this book on a flight from New York to Paris at the start of the holiday season. And to see the French capital all tricked out with Christmas lights and decorations, plus having the recent memory of this book, really softened me up. I haven’t had any consistent Christmas traditions in years, and I’m so glad I finally read this book. It made me understand that Christmas for me is not about the past or whatever perceived future I have, but it’s rather about the present day. What can I make out of Christmas today? What can I do to brighten someone’s day, not just at Christmas but every day? That’s what Scrooge does at the end. He is known for being in the Christmas spirit every day of the year, and that spirit of generosity, joy, and kindness should inspire everyone. So: what are you going to do for others this Christmas to celebrate that joy?